MARINE CORPS BASE CAMP PENDELTON, Calif — Over the roar of the wind, a voice yelled “contact front!” Without hesitation, Sgt. First Class Yusuke Irie of the Japan Ground Self-Defense Force’s Western Army Infantry Regiment Scout Sniper program sprinted to get on line and provide firepower. Surrounded by the sounds of gun fire and yelling, the soldiers alternate seamlessly between providing cover fire and bounding backward. Once out of sight and safe from enemy fire, United States Marine Sgt. Mason Wilhelmy, a pre-scout sniper instructor, 1st Marine Division School’s Pre-Scout Sniper Course, called out “cease fire, cease fire” and signals the soldiers to gather around him. The soldiers of the JGSDF conduct break contact maneuvers in addition to reviewing other essential skills in a condensed scout sniper course instructed by Marines from 1st Marine Division Schools during Exercise Iron Fist 2016 on Marine Corps Base Camp Pendleton, Calif., Feb. 1. Iron Fist is an annual, bilateral amphibious training exercise designed to improve the Marine Corps and JGSDF’s ability to plan, communicate, and conduct combined amphibious operations. Conducting a break contact maneuver properly is a vital skill for a scout sniper unit as they operate with fewer members limiting the available firepower and resources. During a break contact maneuver, the unit members alternate between providing cover fire and moving toward a location where the unit cannot be observed by the enemy and fired upon. “A break contact maneuver it similar to fire-and-maneuver, since we [scout snipers] operate in a small unit, instead of advancing toward the enemy we are bounding backward tactically, to break contact with the enemy.” said Sgt. Robert Murphy, pre-scout sniper instructor, 1st Marine Division School’s Pre-Scout Sniper Course. The course held for the JGSDF scout snipers during Iron Fist is a condensed version of the course Marines participate in when becoming a scout sniper. 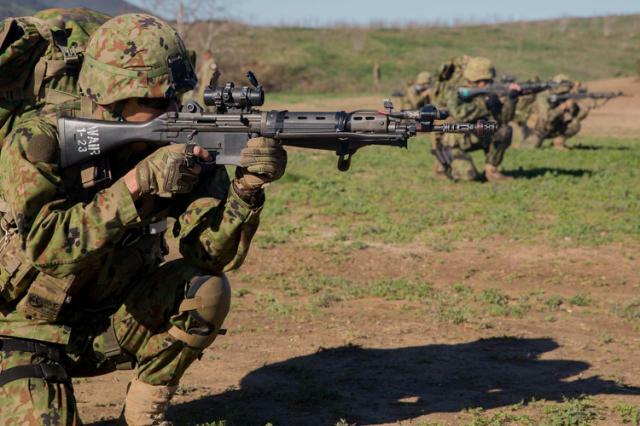 Throughout the course, the JGSDF soldiers review subjects of marksmanship, weapon manipulation, communication, camouflage and break contact maneuvers. “This training will help increase their [JGSDF soldiers] ability as a unit to not only be effective but to communicate with one-another as they maneuver,” said Murphy. A scout sniper unit’s role in an amphibious assault, for instance the assault at the conclusion of Iron Fist in late February, is much different than that of a typical infantry unit. By inserting a scout sniper unit before the initial amphibious assault, a unit is capable of gathering and relaying information and eliminating key enemy targets, said Wilhelmy. The units may also be positioned to provide over watch and fire support for friendly forces who are conducting the amphibious assault. Since the first Iron Fist in 2006, the scout sniper course has provided the opportunity for the Marine Corps and JGSDF to conduct bilateral training while sharing knowledge and experiences with service members from different cultures. “Annual Training like [Iron Fist] is beneficial to continue to not only build a strong relationship between the U.S. and Japan, but to also enhance each other’s operational abilities,” said Murphy.